Google Dashboard lays out the current distribution of Android versions. 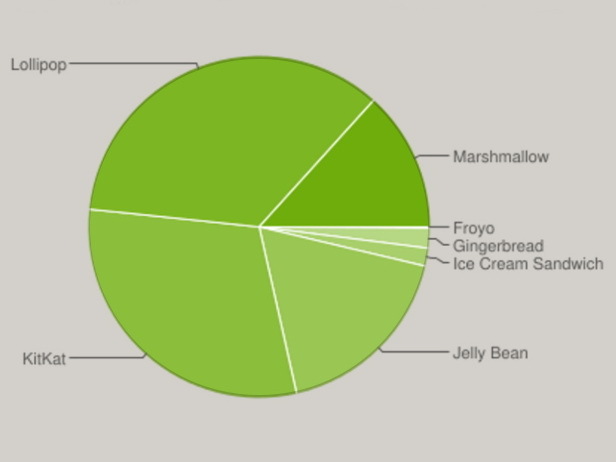 Android 6.0 Marshmallow is gaining ground while Lollipop, KitKat, Jelly Bean, Ice Cream Sandwich, and Gingerbread have all fallen month-over-month. Uptake of Google's latest Android version has been steadily increasing over the past month from 10.1 percent in June 2016 to 13.3 percent as of July 2016. The data is based on the number of Android devices that have accessed the Play Store within a 7-day period ending on July 11 2016. Devices running Android 5.0 Lollipop have been relatively steady during the same time period at 14.3 percent from 15.4 percent the same time last month while 5.1 Lollipop had grown to 20.8 percent from 20.0 percent last month. Thus, Lollipop 5.x remains the most popular Android version at 35.1 percent of all active Android devices. Moving further down the list brings us to Android 4.4 KitKat, which has declined to 30.1 percent from 31.6 percent month-over-month. 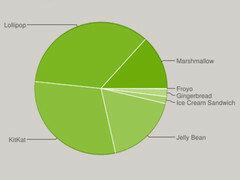 Android 4.1.x to 4.3 Jelly Bean is down to 17.8 percent from 18.9 percent while Android 4.0.3 to 4.0.4 Ice Cream Sandwich is down to 1.7 percent from 1.9 percent during the same period. 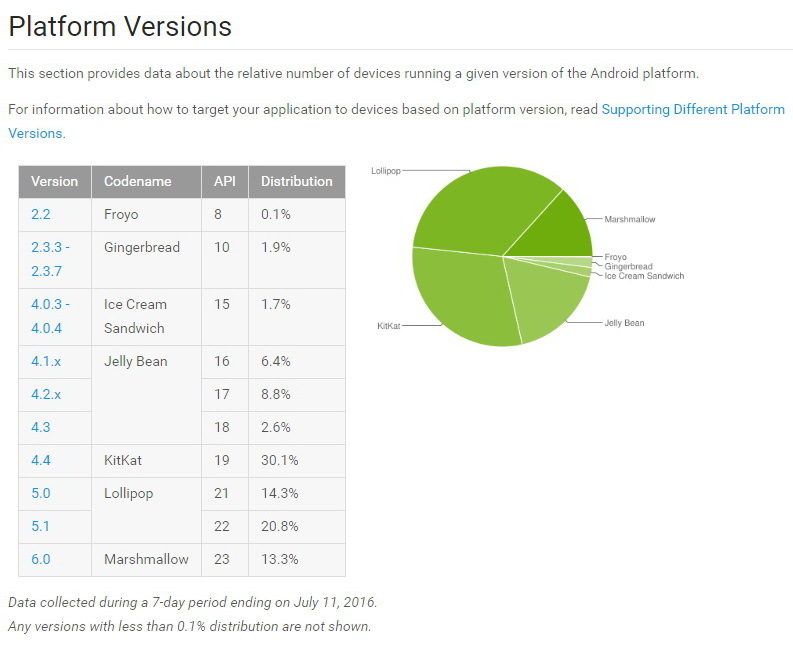 Android 2.3.3 to 2.3.7 Gingerbread is down to 1.9 percent from 2.0 percent and Froyo is still trailing at just 0.1 percent of recorded Android devices.